Glasscubes is a cloud-based platform, which means you must be connected to the internet to access the service. The Offline File Sync tool (OFS) application is perfect if you need access to your files regardless of location, or internet connectivity. It allows you to work offline and then automatically synchronises any updated files to Glasscubes the next time you have an internet connection. OFS is currently only available for Windows PCs and not Macs. IMPORTANT NOTE FOR ADMINISTRATORS: The default setting prevents users that install OFS from deleting content from your Glasscubes account by mistake. 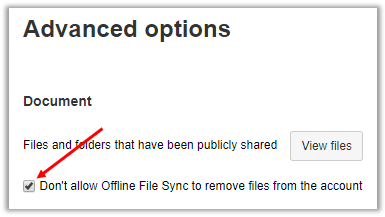 If you would prefer users to be able to delete content offline, which in turn deletes the content from Glasscubes on the next sync, uncheck the box in the image above. You will find this option in Settings>Advanced options.